Every year, about 238,000 patients are diagnosed with brain tumor in the world. Accurate and robust tumor segmentation and prediction of patients’ overall survival are important for diagnosis, treatment planning and risk factor characterization. Here we present a deep learning-based framework for brain tumor segmentation and survival prediction in glioma using multimodal MRI scans. For tumor segmentation, we use ensembles of three different 3D CNN architectures for robust performance through majority rule. This approach can effectively reduce model bias and boost performance. For survival prediction, we extract 4524 radiomic features from segmented tumor region. Then decision tree and cross validation are used to select potent features. Finally, a random forest model is trained to predict the overall survival of patients. 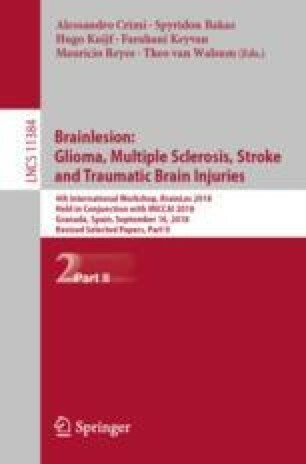 On 2018 MICCAI Multimodal Brain Tumor Segmentation Challenge (BraTS), our method ranks at second place and 5th place out of 60+ participating teams on survival prediction task and segmentation task respectively, achieving a promising 61.0% accuracy on classification of long-survivors, mid-survivors and short-survivors.